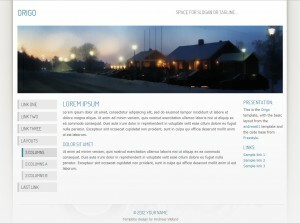 The free Origo HTML/CSS template has been updated to version 1.1. The new version adds two additional 2-column layouts, similar to the example layouts in the andreas01 template. Support for subpages in the navigation menu, as well as a CSS class that highlights the currently active page in the navigation menu, has also been added along with minor code fixes that replaced unused CSS classes in the HTML with appropiate CSS styling. To download the Origo template and see updated screenshots and a live demo, go to the Origo template page. Wow. You have done it again. You have delivered another great template to your loyal template users. I use your themes/templates for all my websites. Just want to use this opportunity to say thanks for the great themes/templates you have been creating. Looks good, clean layout, easy on the eye and easy navigation. Slightly surprised you never used HTML5 tags to create it. I love all andreas Theme. Is theme compatible with WordPress 3.x? Will there be a version for WordPress available? I downloaded and tried Origo. Seems like a nice beautiful theme, very good for informational websites. Hi, When I download the Origo theme, all I get are html files. Am I doing something wrong? The template will be someday? I want put it on my blog.